Have a look at these two articles on particulate matter in air samples. Follow the links to the original articles. “Current legal limits for fine dust in the air are based on the mass and size of the particles. For health effects, however, not only the amount of dust is decisive, but also its chemical composition. Empa researchers have now compared the noxious potential of particulate matter in Switzerland and in China. Anyone who is suddenly shaken by an uncontrollable cough attack on a cloudy day may suffer from the consequences of high fine dust load in the air. Breathing problems, cardiovascular disease and even lung cancer can be caused by these tiny particles. They include soot, metals and engineered nanoparticles. In order to control air quality more widely, a stricter Ordinance on Air Pollution Control has come into effect in Switzerland on 1 June 2018. Since then, PM2.5 has been created as the second standard for even finer suspended solids in addition to PM10. However, both values are only based on the amount of particles smaller than certain size limits – i.e. 10 or 2.5 micrometers in diameter. Empa researchers have now shown in a study that the amount of fine dust alone does not necessarily indicate the noxious potential of the polluted air. Jing Wang and his team from Empa’s Advanced Analytical Technologies lab examined air samples from Switzerland and China. As expected, the air quality of the metropolitan Beijing region performed worse than the samples from Switzerland. With their detailed analyses, however, the researchers also revealed that the composition of fine dust differs. “If we look at the so-called oxidative potential of particulate matter, for example, the effect of some Swiss samples with comparable particle quantities was more severe and therefore more momentous than in China,” says Wang. 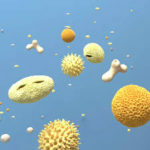 The oxidative potential is a measure of the damaging effect of fine dust, as aggressive substances trigger oxidative stress and reactions of the body’s immune system. Oxidative stress can be caused by metals such as cadmium and arsenic or soot particles. In China, large quantities of ultrafine arsenic particles indicated an increased health risk. Samples from the Zurich suburb of Dübendorf, on the other hand, contained significantly more iron particles in the 10 micrometer range. “The iron particles originate from the abrasion of the nearby railway line,” says the researcher. Together with copper and manganese, the iron dust in the Dübendorf air contributed to the oxidative potential of the air samples. Another Swiss value attracted the attention of the Empa researchers: The air sample from a Swiss farm fared worse than that from a busy road in the middle of Beijing, at least as far as the contamination with certain bacterial products was concerned. It is known that such endotoxins are abundant in the air in the surroundings of cows and Co. And especially for people with a weakened immune system, particles contaminated with bacterial endotoxins can pose a serious health risk. What is PM, and how does it get into the air? “PM stands for particulate matter (also called particle pollution): the term for a mixture of solid particles and liquid droplets found in the air. Some particles, such as dust, dirt, soot, or smoke, are large or dark enough to be seen with the naked eye. Others are so small they can only be detected using an electron microscope. PM2.5 : fine inhalable particles, with diameters that are generally 2.5 micrometers and smaller. These particles come in many sizes and shapes and can be made up of hundreds of different chemicals. Most particles form in the atmosphere as a result of complex reactions of chemicals such as sulfur dioxide and nitrogen oxides, which are pollutants emitted from power plants, industries and automobiles. What are the Harmful Effects of PM? Particulate matter contains microscopic solids or liquid droplets that are so small that they can be inhaled and cause serious health problems. Particles less than 10 micrometers in diameter pose the greatest problems, because they can get deep into your lungs, and some may even get into your bloodstream.